Scotch blends tend to get less credit than they deserve. In fact, any zealous disciple in the Church of the Single Malt wouldn’t be caught dead with his lips to a glass of blended Scotch. One of the chief causes of this bias is the fact that blended Scotch uses a large amount of column distilled grain whisky (or less flavorful filler whisky) to aid in producing the massive volume required for the world market. After all, 90% of whisky consumed in the world is blended. SWC does not share this bias or aversion to blends for there exists a number of quality pours on the shelf with the dreaded word “blended” on the label. 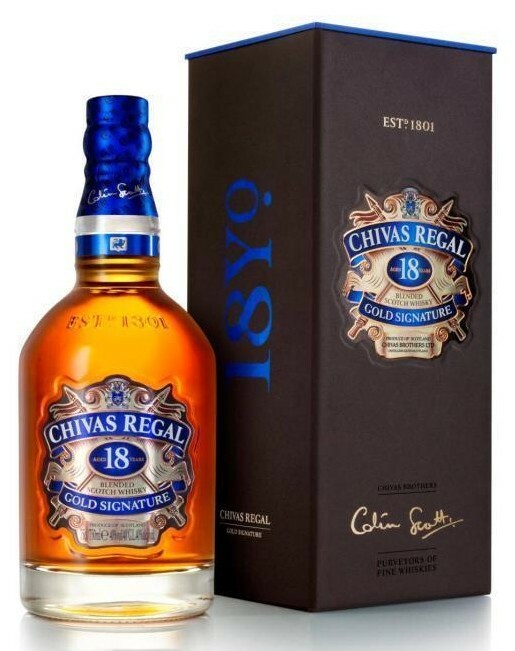 Chivas Regal 18yr Gold Signature is one of those blends worth seeking out. A few particulars first…. Nose- Sweet dried fruit notes of raisin and dates with apricot and orange citrus. Vanilla and butterscotch as it opens up with a floral sweetness. Some musty notes with an oaky dampness to it. Complex. Taste– More citrus. Creamy, mouth coating sweetness. Floral hints of hay/straw with smoke. Finish– Long and drying. Smoky with a sour floral note. Citrus peel. Comments– Well rounded package with great flavors. Nice complexity with plenty of subtle surprises. Always a great value buy. Get it in your cabinet.